Okay, now that I've typed that title, I'm going to have the Bobby Brown song stuck in my head! There are a lot of reasons for knitting a sweater instead of buying one - everything from entertainment to making things that suit only you, to having options to make changes. Today I'm making changes. 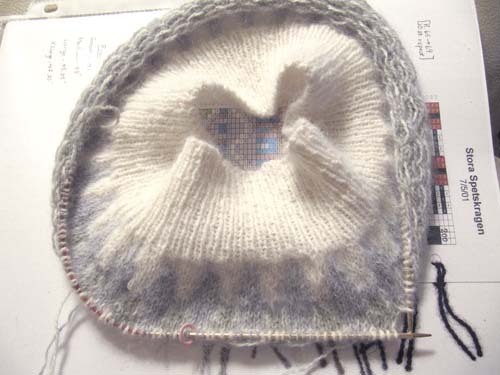 Right from the beginning, I was hesitant about working the purl stitches on my Bohus sweater. I liked the texture it gave the sweater, but I had a picture in my mind of a finished sweater with a smooth yoke. However, I went ahead and worked the pattern as it was written. I didn't mind for most of the chart, but as I got near the end, I was less and less content. It just wasn't what I had in mind. Maybe for the next Bohus (I'm betting that there will be another in my future) but not this time. So, I ripped back to Row 1, slowly and carefully. That was earlier today. Tonight, I've just finished back up to row 17 and I'm much happier as it's the sweater that I had in mind. Update, Sunday morning: I just completed Row 30 and I'm feeling the love for this project now. It's not fun to rip and reknit, but I'm very glad that I did. I don't think there is anything wrong with making a sweater our own and something we really like better but by the same token I would not call this a Bohus anymore because it was those purl stitches that set the Bohus apart from other color patterned sweaters when they were designed. They were the "little pearls" in the sweater. That said, if it was making you not like or enjoy the sweater more power to you and your new design. Enjoy! !